At least in this colt being offered for sale. Coming three, dark bay, huge, elegant, refined colt with a perfect head set and a mile of leg under a deep, well made body. “He’s A Heartbreaker” is aptly named. By WC Centerpiece x Glory Edition, a spectacular line bred Nocturne/In Command mare. “Heartbreaker” is one of the most promising Centerpiece youngsters offered for sale and a member of the last class of Centerpiece offspring prior to his book being closed. This colt was Top Ten in the prestigious Circle J Futurity and has since been in training with Gerry Rushton Stables. He is ready to hook or put under saddle and Stacy feels strongly that saddle is going to be his real forte. This boy is going to be very, very tall and can set his head with the absolute best of them. He is mannerly, kind, eager to please and has a good work ethic. He is going to be a star in the three year old saddle ranks, with the quality to be a breeding horse and the mind to be an AM mount. There is a short video of him up on the GRS website at the onset of his long lining work. I will also attach a yearling photo. 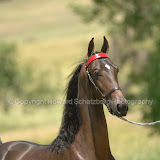 He is priced both to sell and to be offer a fabulous ROI for his new owner. Please contact either Stacy or me if interested.